A newly delivered Airbus A320, F-GFKC, was destroyed when it impacted trees during a low pass over the runway at Mulhouse-Habsheim Airport, France. A fire broke out, killing three occupants. 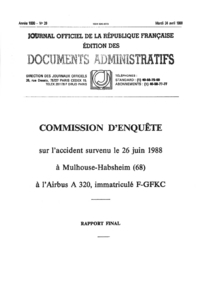 The Mulhouse Flying Club had requested Air France to perform a fly by at their air show at Mulhouse-Habsheim Airport on June 26, 1988. Air France prepared a low speed pass with the gear down at 100 feet and the another pass at high speed in clean configuration. While Air France had performed more than twenty low passes since 1987, the altitude of 100 feet was not allowed according to regulations. French air safety regulations imposed a minimum VFR overflight height of 170 feet. The fly by was to be performed using an Airbus A320, an aircraft model that was introduced by launching customer Air France in March 1988. F-GFKC was the third A320 in the fleet and had been delivered on June 23. The flight crew scheduled to perform the demonstration flight were two captains: the head of A320 training subdivision (Pilot Flying) and a captain participating in the placing into service of the A320(Pilot Monitoring). On board the flight were four cabin crew members and 130 passengers. The aircraft took off from nearby Basle-Mulhouse Airport at 14:41 and climbed to 1000 feet agl. The crew started the descent three minutes later and Habsheim was in sight at 450 feet agl. The Pilot Monitoring informed the Pilot Flying that the aircraft was reaching 100 feet at 14:45:14. The descent continued to 50 feet 8 seconds later and further to 30-35 feet. Go-around power was added at 14:45:35. The A320 continued and touched trees approximately 60 meters from the end of runway 34R at 14:45:40 with a 14 degree pitch attitude and engines at 83% N1. The plane sank slowly into the forest and a fire broke out. PROBABLE CAUSES: "The Commission believes that the accident resulted from the combination of the following conditions: 1) very low flyover height, lower than surrounding obstacles; 2) speed very slow and reducing to reach maximum possible angle of attack; 3) engine speed at flight idle; 4) late application of go-around power. This combination led to impact of the aircraft with the trees. The Commission believes that if the descent below 100 feet was not deliberate, it may have resulted from failure to take proper account of the visual and aural information intended to give the height of the aircraft." The Commission recommends that studies be made to see if it would not be judicious to transmit all warnings and aural announcemants via the pilots headsets. The Commission recommends that: - airline pilots be reminded that their job consists of strictly applying standard and well-defined procedures; - consequently, their training be more oriented towards safety which requires that standard flight conditions be permanently maintained - for the A320 training in particular, the pilots are made aware that the performance limitations still stand, as an any other aircraft, in spite of the many automatic protections (especially with respect to stall and with shear); - for flights made with crew members of the same rank, the functions of each and the task sharing be especially well defined. The Commission recommends that crews performing demonstration flights receive special and well-adapted training, which is not within the scope of the basic training or type qualifications. The Commission recommends the aircraft qualification stage be reinforced and that emphasis be placed an the location and the use of the safety equipment (emergency exits, communication system, megaphone, anti-smoke masks, etc.). Each trainee must handle all the safety equipment on the actual aircraft and a demonstration mock-up. The Commission recommends that means of simulating a realistic environment for training cabin attendants be studied. The Commission suggests that cabin attendants be made more aware of the psychological effect that their remarks and behaviour can have on the passengers. The Commission recommends that: - during the safety demonstrations before each flight, use of the seat belt be demonstrated (closing, tightening, opening). - these procedures be also indicated in the leaflet giving safety instructions for the passengers. - the attention of the seat belt manufacturers be drawn to the advantage of providing unlocking systems where a single simple action causes both unlocking and separation of the two halves of the belt. The investigation commission recommends that : when air shows are organized : - access to the aerodrome is kept open for fire-fighting and first aid vehicles, - the safety facilities in-situ be adapted to the environment . The Commission recommends that: - the preparation of such flights (participation in air shows) includes as a minimal and in addition to the actions already explicitly provided for in the regulations: - the drawing-up of a comprehensive flight safety brief specifying the flight parameters to be observed and the procedures to be followed in case of a failure, - a meeting between the crew and the departments which participated in the flight preparation, organized within good time before the scheduled date of flight, - effective reconnaissance of the place where the flight is to be made, and if possible: - one or more practice flights on a representative flight simulator including special attention to the critical aspects which may result from non-observanoe of the flight parameters, especially in case of a failure. The Investigation Commission recommends that : - this type of flight (participation in air shows) be made without passengers and with minimum crew including only the persons required to carry out the flight, the only manoeuvres authorized with passengers on-board being these laid down in the operating manual. The Commission recommends that the internal rules of the airlines be checked for conformity with official regulations.